APOKYN 10 mg/mL is a clear, colorless, sterile solution for subcutaneous injection and is available in 2 mL ampules and 3 mL cartridges. Each mL of solution contains 10 mg of apomorphine hydrochloride, USP as apomorphine hydrochloride hemihydrate and 1 mg of sodium metabisulfite, NF in water for injection, USP. In addition, each mL of solution may contain sodium hydroxide, NF and/or hydrochloric acid, NF to adjust the pH of the solution. In addition, the cartridges contain 5 mg/mL of benzyl alcohol. Mechanism of Action: APOKYN is a non-ergoline dopamine agonist with high in vitro binding affinity for the dopamine D 4 receptor (K i = 4.4 nM), moderate affinity for the dopamine D 2 , D 3 , and D 5 (K i = 35-83, 26, and 15 nM, respectively), and adrenergic (alpha) 1D , (alpha) 2B , (alpha) 2C (K i = 65, 66, and 36 nM, respectively) receptors, and low affinity for the dopamine D 1 , serotonin 5HT 1A , 5HT 2A , 5HT 2B , and 5HT 2C (K i = 370, 120, 120, 130, and 100 nM, respectively) receptors. Apomorphine exhibits no affinity for the adrenergic (beta) 1 and (beta) 2 or histamine H 1 receptors (K i > 10,000 nM). The precise mechanism of action of APOKYN as a treatment for Parkinson's disease is unknown, although it is believed to be due to stimulation of post-synaptic dopamine D 2 -type receptors within the caudate-putamen in the brain. Apomorphine has been shown to improve motor function in an animal model of Parkinson's disease. In particular, apomorphine attenuates the motor deficits induced by lesions in the ascending nigrostriatal dopaminergic pathway with the neurotoxin 1-methyl-4-phenyl-1,2,3,6-tetrahydropyridine (MPTP) in primates. Pharmacokinetics: Absorption: Apomorphine hydrochloride is a lipophilic compound that is rapidly absorbed (time to peak concentration ranges from 10 to 60 minutes) following subcutaneous administration into the abdominal wall. After subcutaneous administration, apomorphine appears to have bioavailability equal to that of an intravenous administration. Apomorphine exhibits linear pharmacokinetics over a dose range of 2 to 8 mg following a single subcutaneous injection of apomorphine into the abdominal wall in patients with idiopathic Parkinson's disease. Distribution: The plasma-to-whole blood apomorphine concentration ratio is equal to one. Mean (range) apparent volume of distribution was 218L (123 - 404 L). Maximum concentrations in cerebrospinal fluid (CSF) are less than 10% of maximum plasma concentrations and occur 10 to 20 minutes later. Metabolism and Elimination: The mean apparent clearance (range) is 223 L/hr (125 - 401 L/hr) and the mean terminal elimination half-life is about 40 minutes (range about 30 to 60 minutes). The route of metabolism in humans is not known. Potential routes of metabolism in humans include sulfation, N-demethylation, glucuronidation and oxidation. In vitro , apomorphine undergoes rapid autooxidation. Special Populations: The clearance of apomorphine does not appear to be influenced by age, gender, weight, duration of Parkinson's disease, levodopa dose or duration of therapy. Hepatic Impairment: In a study comparing subjects with hepatic impairment (moderately impaired as determined by the Child-Pugh classification method) to healthy matched volunteers, the AUC 0-(infinity) and C max values were increased by approximately 10% and 25%, respectively, following a single subcutaneous administration of apomorphine into the abdominal wall. Studies in subjects with severe hepatic impairment have not been conducted (see PRECAUTIONS and DOSAGE AND ADMINISTRATION ). Renal Impairment: In a study comparing renally-impaired subjects (moderately impaired as determined by estimated creatinine clearance) to healthy matched volunteers, the AUC 0-(infinity) and C max values were increased by approximately 16% and 50%, respectively, following a single subcutaneous administration of apomorphine into the abdominal wall. The mean time to peak concentrations and the mean terminal half-life of apomorphine were unaffected by the renal status of the individual. Studies in subjects with severe renal impairment have not been conducted. The starting dose for patients with mild or moderate renal impairment should be reduced (see PRECAUTIONS and DOSAGE AND ADMINISTRATION ). Drug-Drug Interactions: Carbidopa/levodopa: Levodopa pharmacokinetics were unchanged when subcutaneous apomorphine and levodopa were co-administrated in patients. However, motor response differences were significant. The threshold levodopa concentration necessary for an improved motor response was reduced significantly, leading to an increased duration of effect without a change in the maximal response to levodopa therapy. Other Drugs Eliminated Via Hepatic Metabolism: Based upon an in vitro study, cytochrome P450 enzymes play a minor role in the metabolism of apomorphine. In vitro studies have also demonstrated that drug interactions are unlikely due to apomorphine acting as a substrate, an inhibitor, or an inducer of cytochrome P450 enzymes. COMT Interactions: A pharmacokinetic interaction of apomorphine with catechol-O-methyl transferase (COMT) inhibitors or drugs metabolized by this route is unlikely since apomorphine appears not to be metabolized by COMT. Clinical Studies: The effectiveness of APOKYN in the acute symptomatic treatment of the recurring episodes of hypomobility, "off" episodes ("end-of-dose wearing off" and unpredictable "on/off" episodes), associated with advanced Parkinson's disease was established in three randomized, controlled trials. On average, patients participating in these trials had Parkinson's disease for 11.3 years and were being treated with L-dopa and at least one other agent, usually an oral dopamine agonist. One of the three studies was conducted in patients who did not have prior exposure to apomorphine and two were conducted in patients with at least 3 months of apomorphine use immediately prior to study enrollment. Almost all patients without prior exposure to apomorphine began taking an antiemetic (trimethobenzamide) three days prior to starting apomorphine. After exposure to apomorphine, 50% of patients were able to discontinue use of a concomitant antiemetic, on average 2 months after initiating apomorphine. Change in Part III (Motor Examination) of the Unified Parkinson's Disease Rating Scale (UPDRS) served as the primary outcome assessment measure in each study. Part III of the UPDRS contains 14 items designed to assess the severity of the cardinal motor findings (e.g., tremor, rigidity, bradykinesia, postural instability, etc.) in patients with Parkinson's disease. The first trial used a parallel design, randomizing 29 patients with advanced Parkinson's disease to subcutaneous apomorphine or placebo in a 2:1 ratio. Patients had no prior exposure to apomorphine. In an office setting, hypomobility was allowed to occur by withholding the patients' Parkinson's disease medications overnight. The following morning, patients (in a hypomobile state) were started in a blinded fashion on study treatment (placebo or 2 mg of apomorphine) and redosed at increasing doses, after at least 2 hours, until a therapeutic response approximately equivalent to the individual patient's response to their usual dose of levodopa was observed (or until 10 mg apomorphine or placebo equivalent was given). At each redosing, study drug was increased by 2 mg or 0.2 mL (to 4 mg, 6 mg, 8 mg, or 10 mg of apomorphine) or placebo equivalent. Of the 20 patients assigned to apomorphine, 18 achieved a therapeutic response at about 20 minutes that was approximately equivalent to the therapeutic response to a usual dose of levodopa. The average apomorphine dose was 5.4 mg (3 patients on 2 mg, 7 on 4 mg, 5 on 6 mg, 3 on 8 mg, and 2 on 10 mg). In contrast, of the 9 patients assigned to placebo, none reached such a therapeutic response. The mean changes-from-baseline for UPDRS Part III scores at the best dose were 23.9 and 0.1 for the apomorphine and placebo respectively (p < 0.0001). The second trial used a crossover design, randomizing 17 patients who had been using apomorphine for at least 3 months. Patients received their usual morning doses of Parkinson's disease medications and were followed until hypomobility occurred, at which time they received either a single dose of subcutaneous apomorphine (at their usual dose) or placebo. Their UPDRS Part III scores were then evaluated over time. The average dose of apomorphine was 4 mg (2 patients on 2 mg, 9 on 3 mg, 2 on 4 mg, and 1 each on 4.5 mg, 5 mg, 8 mg, and 10 mg). On average, the mean changes-from-baseline UPDRS Part III scores at 20 minutes were 20.0 and 3.0 points for the apomorphine and placebo groups respectively (p < 0.0001). The third trial used a parallel design, randomizing 62 patients who had been using apomorphine for at least 3 months. Patients were randomized in a 2:1 (active: placebo) ratio to one of four groups and were dosed once. The groups were: apomorphine at the usual dose, placebo at a volume matching the usual apomorphine dose, apomorphine at the usual dose + 2 mg (0.2 mL), or placebo at a volume matching the usual apomorphine dose + 0.2 mL. Patients received their usual morning doses of Parkinson's disease medications and were followed until hypomobility occurred, at which time they received the randomized treatment. The mean changes-from-baseline for UPDRS Part III scores at 20 minutes post dosing were 24.2 and 7.4 points for the pooled apomorphine groups and the pooled placebo groups, respectively (p < 0.0001). 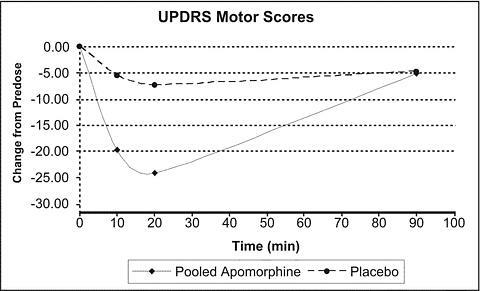 The figure below describes the mean change in UPDRS Motor Scores over time after pooled apomorphine and pooled placebo administration. In this third trial, comparing patients randomized to apomorphine at the usual dose (mean dose about 4.5 mg) and patients randomized to apomorphine + 2 mg (mean dose about 6 mg), the mean changes-from-baseline for UPDRS Part III scores at 20 minutes post dosing were 24 and 25, respectively. This suggests that patients chronically treated at a dose of 4 mg might derive little additional benefit from a dose increment of 2 mg. There was an increased incidence of adverse events in patients randomized to apomorphine + 2 mg.
APOKYN (apomorphine hydrochloride injection) is indicated for the acute, intermittent treatment of hypomobility, "off" episodes ("end-of-dose wearing off" and unpredictable "on/off" episodes) associated with advanced Parkinson's disease. APOKYN has been studied as an adjunct to other medications (see CLINICAL PHARMACOLOGY : Clinical Studies ). Based on reports of profound hypotension and loss of consciousness when apomorphine was administered with ondansetron, the concomitant use of apomorphine with drugs of the 5HT 3 antagonist class (including, for example, ondansetron, granisetron, dolasetron, palonosetron, and alosetron) is contraindicated. APOKYN is contraindicated in patients who have demonstrated hypersensitivity to the drug or its ingredients (notably sodium metabisulfite). Avoid Intravenous Administration: Serious adverse events (such as intravenous crystallization of apomorphine, leading to thrombus formation and pulmonary embolism) have followed the intravenous administration of apomorphine. Consequently, apomorphine should not be administered intravenously. General: The significant adverse events described below have been reported in association with the use of subcutaneous apomorphine, but almost all of them occurred during open-label, uncontrolled studies. In the development program, the controlled trial data involved relatively few patients, and examined primarily the effects of single doses. Because the background rate of many of these events in a population of patients with advanced Parkinson's disease is unknown, it is difficult to assess the role of apomorphine in their causation. Nausea and Vomiting: At the recommended doses of apomorphine, severe nausea and vomiting can be expected. Because of this, in domestic clinical studies, 98% of all patients were treated with the antiemetic trimethobenzamide for three days prior to beginning apomorphine and were then encouraged to continue trimethobenzamide for at least 6 weeks. Among 522 patients treated, 262 (50%) discontinued trimethobenzamide while continuing apomorphine. The average time to discontinuation of trimethobenzamide was about 2 months (range: 1 day to 33 months). For the 262 patients who discontinued trimethobenzamide, 249 patients continued apomorphine without trimethobenzamide for a duration of follow-up that averaged 1 year (range: 0-3 years). Even with the use of trimethobenzamide in clinical trials, 31% of the patients experienced nausea and 11% of the patients experienced vomiting. In clinical trials, 3% of the patients discontinued apomorphine due to nausea and 2% discontinued due to vomiting. In the domestic development of apomorphine, there was no experience with antiemetics other than trimethobenzamide. Some antiemetics with anti-dopaminergic actions have the potential to worsen the clinical state of patients with Parkinson's disease and should be avoided. Syncope: In clinical studies, about 2% of patients experienced syncope. QT Prolongation and Potential for Proarrhythymic Effects: In a study in which patients received increasing single doses of apomorphine from 2 to 10 mg (if tolerated) as well as placebo, the mean difference in QTc between apomorphine and placebo, as measured by Holter monitor, was 0 msec at 4 mg, 1 msec at 6 mg, and 7 msec at 8 mg. Too few patients received a 10 mg dose to be able to adequately characterize the change in QTc interval at that dose. In a controlled trial in which patients were administered placebo or a single dose of apomorphine (mean dose of 5.2 mg; range of 2-10 mg, with 30 of 35 patients receiving a dose of 6 mg or less), the mean difference between apomorphine and placebo in the change in QTc was about 3 msec at 20 and 90 minutes. In the entire database, 2 patients (one at 2 and 6 mg, one at 6 mg) exhibited large QTc increments (> 60 msecs from pre-dose) and had QTc intervals greater than 500 msecs acutely after dosing. Doses of 6 mg or less thus are associated with minimal increases in QTc. Doses greater than 6 mg do not provide additional clinical benefit and are not recommended. Some drugs that prolong the QT/QTc interval have been associated with the occurrence of torsades de pointes and with sudden unexplained death. The relationship of QT prolongation to torsades de pointes is clearest for larger increases (20 msec and greater), but it is possible that smaller QT/QTc prolongations may also increase risk, or increase it in susceptible individuals, such as those with hypokalemia, hypomagnesemia, bradycardia, concomitant use of other drugs that prolong the QTc interval, or genetic predisposition (e.g., congenital prolongation of the QT interval). Although torsades de pointes has not been observed in association with the use of apomorphine at recommended doses in premarketing studies, experience is too limited to rule out an increased risk. Palpitations and syncope may signal the occurrence of an episode of torsades de pointes. Caution is recommended when administering apomorphine to patients with the risk factors described above. Symptomatic Hypotension: Dopamine agonists may cause orthostatic hypotension at any time, especially during dose escalation. Parkinson's disease patients, in addition, may have an impaired capacity to respond to an orthostatic challenge. For these reasons, Parkinson's disease patients being treated with dopaminergic agonists ordinarily require careful monitoring for signs and symptoms of orthostatic hypotension, especially during dose escalation, and should be informed of this risk. Apomorphine causes dose-related decreases in systolic (SBP) and diastolic blood pressure (DBP). Dose-dependent mean decrements in SBP ranged from 5 mm Hg after 2 mg to 16 mm Hg after 10 mg. Dose-dependent mean decrements in DBP ranged from 3 mm Hg after 2 mg to 8 mm Hg after 10 mg. These changes were observed at 10 minutes, appeared to peak at about 20 minutes after dosing, and persisted up to at least 90 minutes post-dosing. Patients undergoing titration of apomorphine showed an increased incidence (from 4% pre-dose to 18% post-dose) of systolic orthostatic hypotension ( >/= 20 mmHg decrease) when evaluated at various times after in-office dosing. A small number of patients developed severe systolic orthostatic hypotension ( >/= 30 mmHg decrease and systolic BP </= 90 mmHg) after subcutaneous apomorphine injection. In clinical trials of apomorphine in patients with advanced Parkinson's disease, 59 of 550 patients (11%) had orthostatic hypotension, hypotension, and/or syncope. These events were considered serious in 4 patients (< 1%) and resulted in withdrawal of apomorphine in 10 patients (2%). These events occurred both with initial dosing and during long-term treatment. Whether or not hypotension contributed to other significant adverse events seen (e.g., falls), is unknown. The effects of apomorphine on blood pressure may be increased by the concomitant use of alcohol, antihypertensive medications, and vasodilators (especially nitrates). Alcohol should be avoided when using Apokyn and extra caution should be exercised if Apokyn must be administered with concomitant antihypertensive medications and/or vasodilators (see PRECAUTIONS : Drug Interactions and Information for Patients ). Falls: Patients with Parkinson's disease (PD) are at risk of falling due to the underlying postural instability and concomitant autonomic instability seen in some patients with PD, and from syncope caused by the blood pressure lowering effects of the drugs used to treat PD. Subcutaneous apomorphine might increase the risk of falling by simultaneously lowering blood pressure and altering mobility (see WARNINGS : Symptomatic Hypotension ; PRECAUTIONS : Dyskinesias ). In clinical trials, 30% of patients had events that could reasonably be considered falls and about 5% of patients had falls that were considered serious. Because these data were obtained in open, uncontrolled studies, and given the unknown background rate of falls in a population of patients with advanced Parkinson's disease, it is impossible to definitively assess the contribution of apomorphine to these events. Hallucinations: During clinical development, hallucinations were reported by 14% of the patients. Hallucinations resulted in discontinuation of apomorphine in 1% of patients. Falling Asleep During Activities of Daily Living: There have been reports in the literature of patients treated with apomorphine subcutaneous injections who suddenly fell asleep without prior warning of sleepiness while engaged in activities of daily living. It is clear that somnolence is commonly associated with APOKYN and many clinical experts believe that falling asleep while engaged in activities of daily living always occurs in a setting of pre-existing somnolence even if patients do not give such a history. Prescribers should therefore continually reassess patients for drowsiness or sleepiness, especially since some of the events occur well after the start of treatment. Prescribers should also be aware that patients may not acknowledge drowsiness or sleepiness until directly questioned about drowsiness or sleepiness during specific activities. Before initiating treatment with APOKYN, patients should be advised of the possibility that they may develop drowsiness and specifically asked about factors that could increase the risk with APOKYN, such as concomitant sedating medications and the presence of sleep disorders. If a patient develops significant daytime sleepiness or episodes of falling asleep during activities that require active participation (e.g., conversations, eating, etc. ), APOKYN should ordinarily be discontinued. If a decision is made to continue APOKYN, patients should be advised not to drive and to avoid other potentially dangerous activities. There is insufficient information to determine whether dose reduction will eliminate episodes of falling asleep while engaged in activities of daily living. Coronary Events: During clinical development, 4% of patients treated with apomorphine experienced angina, myocardial infarction, cardiac arrest and/or sudden death; some cases of angina and myocardial infarction occurred in close proximity to apomorphine dosing (within 2 hours), while other cases of cardiac arrest and sudden death were observed at times unrelated to dosing. Apomorphine has been shown to reduce resting systolic and diastolic blood pressure and, as such, it has the potential to exacerbate coronary (and cerebral) ischemia. Extra caution should be used in prescribing apomorphine for patients with known cardiovascular and cerebrovascular disease. If patients develop signs and symptoms of coronary or cerebral ischemia, the continued use of apomorphine should be carefully re-evaluated. Contains Sulfite: APOKYN contains sodium metabisulfite, a sulfite that may cause allergic-type reactions, including anaphylactic symptoms and life-threatening or less severe asthmatic episodes in certain susceptible people. The overall prevalence of sulfite sensitivity in the general population is unknown and probably low. Sulfite sensitivity is seen more frequently in asthmatic than in non-asthmatic people. Injection Site Reactions: Among the 550 patients treated with apomorphine subcutaneous injections during development, 26% of patients complained of injection site reactions, including bruising (16%), granuloma (4%), and pruritus (2%). There was a limited experience (both for overall numbers of patients as well as the total number of injections per patient) with apomorphine injections in controlled trials. In this limited controlled experience, the number of injection site reactions reported by patients receiving apomorphine was similar to that reported by patients receiving placebo. Potential for Abuse: There are rare reports of apomorphine abuse by patients with Parkinson's disease in other countries. These cases are characterized by increasingly frequent dosing leading to hallucinations, dyskinesia, and abnormal behavior. Psychosexual stimulation with increased libido is believed to underlie these cases. Prescribers should be vigilant for evidence that patients are abusing apomorphine, such as use out of proportion to motor signs (see DRUG ABUSE AND DEPENDENCE ). Dyskinesias: Apomorphine may cause dyskinesia or exacerbate preexisting dyskinesia. During clinical development, dyskinesia or worsening of dyskinesia was reported in 24% of patients. Overall, 2% of patients withdrew from studies due to dyskinesias. Events Reported with Dopaminergic Therapy: Although the events enumerated below have not been reported in association with the use of apomorphine, they are associated with the use of other dopaminergic drugs. Withdrawal-emergent Hyperpyrexia and Confusion: Although not reported with apomorphine, a symptom complex resembling the neuroleptic malignant syndrome (characterized by elevated temperature, muscular rigidity, altered consciousness, and autonomic instability), with no other obvious etiology, has been reported in association with rapid dose reduction, withdrawal of, or changes in antiparkinsonian therapy. Fibrotic Complications: Cases of retroperitoneal fibrosis, pulmonary infiltrates, pleural effusion, pleural thickening, and cardiac valvulopathy have been reported in some patients treated with ergot-derived dopaminergic agents. While these complications may resolve when the drug is discontinued, complete resolution does not always occur. Although these adverse events are believed to be related to the ergoline structure of these compounds, whether other, nonergot derived dopamine agonists can cause them is unknown. Priapism: Apomorphine may cause prolonged painful erections in some patients. During clinical development, painful erections were reported by 3 of 361 males (< 1%), and one patient withdrew from apomorphine therapy because of priapism. Although no patients in the clinical development program required surgical intervention, severe priapism may require surgical intervention. Hepatic Impairment: Caution should be exercised when administrating apomorphine to patients with mild and moderate hepatic impairment due to the increased C max and AUC in these patients. Studies of subjects with severe hepatic impairment have not been conducted (see CLINICAL PHARMACOLOGY and DOSAGE AND ADMINISTRATION ). Renal Impairment: The starting dose should be reduced to 1 mg when administrating apomorphine to patients with mild or moderate renal impairment because the C max and AUC are increased in these patients. Studies in subjects with severe renal impairment have not been conducted (see CLINICAL PHARMACOLOGY and DOSAGE AND ADMINISTRATION ). Retinal Pathology in Albino Rats: Retinal degeneration has been observed in albino rats treated with dopamine agonists for prolonged periods (generally during 2-year carcinogenicity studies). This lesion has also been observed when albino rats were exposed to these agents for shorter periods under higher intensity light exposures. Similar changes have not been observed in 2-year carcinogenicity studies in albino mice or in rats or monkeys treated for 1 year. APOKYN has not been tested in carcinogenicity studies, but based on its mechanism of action it would be expected to cause similar toxicity. The significance of this effect in humans has not been established, but cannot be disregarded because disruption of a mechanism that is universally present in vertebrates (e.g., disk shedding) may be involved. Information for Patients: APOKYN is intended only for subcutaneous injection and must not be given intravenously. Patients and caregivers should be urged to read the attached Patient Package Insert and Directions for Use of the ampule and dosing pen. Patients should be instructed to use APOKYN only as prescribed. Patients and/or caregivers who are advised to administer APOKYN in medically unsupervised situations should receive instruction on the proper use of the product from the physician or other suitably qualified health care professional and then observed during the initial dosing. In particular, patients and caregivers must receive detailed instruction in the use of the dosing pen, with particular attention paid to two issues: 1) Patients need to be aware that the drug is dosed in milliliters, not milligrams. Patients should be particularly cautioned that a dose of 1 mg is represented on the dosing pen as 0.1 mL, and not as 1.0 (the latter representing a dose of 10 mg). It is critical that patients and caregivers be made to understand this distinction to prevent potentially life-threatening overdose if a dose of 1 mg is prescribed. 2) Patients and caregivers must be informed that it is possible to dial in their usual dose of apomorphine even though the cartridge may contain less than that amount of drug. In this case, they will receive only a partial dose with the injection, and the amount left to inject will appear in the dosing window. To complete the correct dose, patients/caregivers will need to "re-arm" the device and dial in the correct amount of the remaining dose. If at all possible, this situation should be avoided, and patients and caregivers should be alerted to the fact that there may be insufficient drug left in the cartridge to deliver a complete dose (for example, patients and caregivers should be urged to keep records of how many doses they have delivered for each cartridge, so that they can replace any cartridge that has an inadequate amount of drug remaining). Patients should be instructed to rotate the injection site and to observe proper aseptic technique. Patients should be advised that they may develop postural (orthostatic) hypotension with or without symptoms such as dizziness, nausea, syncope, and sometimes sweating. Hypotension and/or orthostatic symptoms may occur more frequently during initial therapy or with an increase in dose at any time (cases have been seen after months of treatment). Accordingly, patients should be cautioned against rising rapidly after sitting or lying down, especially if they have been sitting or lying for prolonged periods, and especially at the initiation of treatment with APOKYN. Alcohol, antihypertensive medications, and vasodilating medications may potentiate the hypotensive effect of apomorphine (see WARNINGS : Symptomatic Hypotension ; PRECAUTIONS : Drug Interactions ). Patients should be alerted to the potential sedating effects of APOKYN, including somnolence and the possibility of falling asleep while engaged in activities of daily living. Since somnolence is a frequent adverse event with potentially serious consequences, patients should neither drive a car nor engage in other potentially dangerous activities until they have gained sufficient experience with APOKYN to gauge whether or not it affects their mental and/or motor performance adversely. Patients should be advised that if increased somnolence or episodes of falling asleep during activities of daily living (e.g., watching television, passenger in a car, etc.) are experienced at any time during treatment, they should not drive or participate in potentially dangerous activities until they have contacted their physician. Because of possible additive effects, caution should be advised when patients are taking other sedating medications or alcohol in combination with APOKYN. Because apomorphine has not been evaluated for effects on reproduction and embryo-fetal development, patients should be advised to notify their physicians if they become pregnant or intend to become pregnant (see PRECAUTIONS : Pregnancy ). Because of the possibility that apomorphine may be excreted in breast milk, patients should be advised to notify their physicians if they intend to breast-feed. Rare cases of abuse (use of apomorphine significantly in excess of prescribed frequency) have been reported. Apomorphine abuse may be associated with inappropriate sexual behavior. 5HT 3 Antagonists: Based on reports of profound hypotension and loss of consciousness when apomorphine was administered with ondansetron, the concomitant use of apomorphine with drugs of the 5HT 3 antagonist class (including, for example, ondansetron, granisetron, dolasetron, palonosetron, and alosetron) is contraindicated (see CONTRAINDICATIONS ). Antihypertensive Medications and Vasodilators: The following adverse events were experienced more commonly in patients receiving concomitant antihypertensive medications or vasodilators (n = 94) compared to patients not receiving these concomitant drugs (n = 456): hypotension 10% vs 4%, myocardial infarction 3% vs 1%, serious pneumonia 5% vs 3%, serious falls 9% vs 3%, and bone and joint injuries 6% vs 2%. The mechanism underlying many of these events is unknown, but may represent increased hypotension (see WARNINGS : Symptomatic Hypotension ). Dopamine Antagonists: Since apomorphine is a dopamine agonist, it is possible that dopamine antagonists, such as the neuroleptics (phenothiazines, butyrophenones, thioxanthenes) or metoclopramide, may diminish the effectiveness of APOKYN. Patients with major psychotic disorders, treated with neuroleptics, should be treated with dopamine agonists only if the potential benefits outweigh the risks. Drugs Prolonging the QT/QTc Interval: Caution should be exercised when prescribing apomorphine concomitantly with drugs that prolong the QT/QTc interval (see WARNINGS : QT Prolongation and Potential for Proarrhythmic Effects ). Drug/Laboratory Test Interactions: There are no known interactions between APOKYN and laboratory tests. Carcinogenesis, Mutagenesis, Impairment of Fertility: Carcinogenicity studies have not been conducted with APOKYN. Apomorphine was mutagenic in the in vitro bacterial Ames test and the in vitro mammalian mouse lymphoma assay. Apomorphine was also clastogenic in the in vitro chromosomal aberration assay in human lymphocytes and the in vitro mouse lymphoma assay. Apomorphine was negative in the in vivo micronucleus assay in mice. In a published fertility study in male rats, an adverse effect on fertility was observed at a dose of 2 mg/kg administered subcutaneously (0.6 times the MRHD in a mg/m 2 basis). A significant decrease in testis weight was observed in a 39-week study in cynomolgus monkey at subcutaneous doses of 1.0 and 1.5 mg/kg (0.6 and 1 times the MRHD on a mg/m 2 basis). Pregnancy: Pregnancy Category C: Reproduction studies have not been conducted with apomorphine. It is also not known whether apomorphine can cause fetal harm when administered to a pregnant woman or can affect reproductive capacity. Apomorphine should be given to a pregnant woman only if clearly needed. Nursing Mothers: It is not known whether apomorphine is excreted in human milk. Because many drugs are excreted in human milk and because of the potential for serious adverse reactions in nursing infants from apomorphine, a decision should be made as to whether to discontinue nursing or to discontinue the drug, taking into account the importance of the drug to the mother. Pediatric Use: The safety and efficacy of APOKYN in pediatric patients has not been established. Geriatric Use: In the apomorphine clinical development program, there were 239 patients less than 65 years of age and 311 who were 65 years of age or older. Adverse events were about equally common in older and younger patients (90 vs 87%), but with older patients more likely to experience confusion and hallucinations. Serious adverse events (life-threatening events or events resulting in hospitalization and/or increased disability) were also more common in older patients (27 vs 17%), with older patients more likely to fall (experiencing bone and joint injuries), have cardiovascular events, develop respiratory disorders, and have gastrointestinal events. Older patients were more likely to discontinue apomorphine treatment as a result of adverse events (29 vs 21%). Adverse Event Incidence in Controlled Clinical Studies: APOKYN has been administered to 550 Parkinson's disease patients who were taking some form of L-Dopa along with other Parkinson's disease medications. Eighty-six percent of patients were taking a concomitant dopamine agonist. All patients had some degree of spontaneously occurring hypomobility ("off episodes") at baseline. Adverse events were recorded by the clinical investigators using terminology of their own choosing. To provide a meaningful estimate of the proportion of individuals having adverse events, similar types of events were grouped into a smaller number of standardized categories using MEDRA dictionary terminology. The most common adverse events seen in controlled trials were yawning, dyskinesias, nausea and/or vomiting, somnolence, dizziness, rhinorrhea, hallucinations, edema, chest pain, increased sweating, flushing, and pallor. The most extensive experience with apomorphine in randomized, controlled trials comes from a multicenter randomized placebo-controlled parallel group trial conducted in apomorphine-na[iacute]ve PD patients treated for up to 4 weeks (Table 1). Individual apomorphine doses in this trial ranged from 2-10 mg, optimized to achieve control of symptoms comparable to each patient's response to his or her usual dose of L-dopa. The prescriber should be aware that these figures cannot be used to predict the incidence of adverse events in the course of usual medical practice where patient characteristics and other factors differ from those that prevailed in the clinical studies. Similarly, the cited frequencies cannot be compared with figures obtained from other clinical investigations involving different treatments, uses, and investigators. However, the cited figures do provide the prescribing physician with some basis for estimating the relative contribution of drug and nondrug factors to the adverse-event incidence rate in the population studied. Other Adverse Events Observed During All Phase 2/3 Clinical Trials: APOKYN has been administered to 550 patients; 89% had at least one adverse event (AE). The most common AEs in addition to those in Table 1 (occurring in at least 5% of the patients and at least plausibly related to treatment) in descending order were injection site complaint, fall, arthralgia, insomnia, headache, depression, urinary tract infection, anxiety, congestive heart failure, limb pain, back pain, Parkinson's disease aggravated, pneumonia, confusion, sweating increased, dyspnea, fatigue, ecchymosis, constipation, diarrhea, weakness, and dehydration. Potential for Abuse: A rarely reported motivation for apomorphine abuse (escalation of dose beyond prescribed frequency) is the use of apomorphine to attempt to avoid all symptoms of all "off" events when "off" events occur frequently. A second, rarely reported, motivation for apomorphine abuse is a psychosexual reaction related to the stimulation of penile erection and increase in libido. Adverse events that have been reported in males with overuse include frequent penile erections, atypical sexual behavior, heightened libido, dyskinesias, agitation, confusion, and depression. No studies have been conducted to evaluate the potential for dependence when apomorphine is used as acute (rescue) treatment of "off" episodes in the patients with "on/off" or "wearing-off" effects associated with late stage Parkinson's disease. Intermittent Injection: A report of an accidental overdose of 25 mg injected subcutaneously in a 62 year old man was published in Journal of Neurology, Neurosurgery, and Psychiatry (1990), Vol. 53, pp. 96-102. After 3 minutes, the patient felt nauseated and lost consciousness for 20 minutes. Afterwards, he was alert with a heart rate 40/minute and a supine blood pressure of 90/50. He recovered completely within an hour. The prescribed dose of APOKYN should always be expressed in mL to avoid confusion and doses greater than 0.6 mL (6 mg) are not recommended. Patients and caregivers must receive detailed instructions in the preparation and injection of doses, with particular attention paid to the correct use of the dosing pen (see PRECAUTIONS : Information for Patients ). APOKYN is indicated for subcutaneous administration only. APOKYN should not be initiated without use of a concomitant antiemetic (see WARNINGS : Nausea and Vomiting ). Most antiemetic experience is with trimethobenzamide and this should generally be used. Trimethobenzamide (300 mg tid orally) should be started 3 days prior to the initial dose of apomorphine and continued at least during the first two months of therapy. Based on reports of profound hypotension and loss of consciousness when apomorphine was administered with ondansetron, the concomitant use of apomorphine with drugs of the 5HT 3 antagonist class (including, for example, ondansetron, granisetron, dolasetron, palonosetron, and alosetron) is contraindicated (see CONTRAINDICATIONS ). Patients in an "off" state should be given a 0.2 mL (2 mg) test dose in a setting where blood pressure can be closely monitored by medical personnel. Both supine and standing blood pressure should be checked predose and at 20, 40, and 60 minutes post dose. Patients who develop clinically significant orthostatic hypotension in response to this test dose of apomorphine should not be considered candidates for treatment with APOKYN. If the patient tolerates the 0.2 mL (2 mg) dose, and responds, the starting dose should be 0.2 mL (2 mg) used on an as needed basis to treat existing "off" episodes. If needed, the dose can be increased in 0.1 mL (1 mg) increments every few days on an outpatient basis. Beyond this, the general principle guiding dosing (described in detail below) is to determine a dose (0.3 mL or 0.4 mL) that the patient will tolerate as a test dose under monitored conditions, and then begin an outpatient dosing trial (periodically assessing both efficacy and tolerability) using a dose 0.1 mL (1 mg) lower than the tolerated test dose. For patients who tolerate the test dose of 0.2 mL (2 mg) but achieve no response, a dose of 0.4 mL (4 mg) may be administered at the next observed "off" period, but no sooner than 2 hours after the initial test dose of 0.2 mL (2 mg). Both supine and standing blood pressure should be checked predose and at 20, 40, and 60 minutes post dose. If the patient tolerates a test dose of 0.4 mL (4 mg) the starting dose should be 0.3 mL (3 mg) used on an as needed basis to treat existing "off" episodes. If needed, the dose can be increased in 0.1 mL (1 mg) increments every few days on an outpatient basis. If a patient does not tolerate a test dose of 0.4 mL (4 mg), a test dose of 0.3 mL (3 mg) may be administered during a separate "off" period, no sooner than 2 hours after the test dose of 0.4 mL (4 mg). Both supine and standing blood pressure should be checked predose and at 20, 40, and 60 minutes post dose. If the patient tolerates the 0.3 mL (3 mg) test dose, the starting dose should be 0.2 mL (2 mg) used on an as needed basis to treat existing "off" episodes. If needed, and the 0.2 mL (2 mg) dose is tolerated, the dose can be increased to 0.3 mL (3 mg) after a few days. In such a patient, the dose should ordinarily not be increased to 0.4 mL (4 mg) on an out-patient basis. Most patients studied in the apomorphine development program responded to 0.3 mL to 0.6 mL (3 mg to 6 mg). There is no evidence from controlled trials that doses greater than 0.6 mL (6 mg) give an increased effect and these doses are not recommended. The average frequency of dosing was 3 times per day in the development program, and there is limited experience with single doses greater than 0.6 mL (6 mg), dosing more than 5 times per day and with total daily doses greater than 2.0 mL (20 mg). If a single dose of apomorphine is ineffective for a particular "off" period, a second dose should not be given for that "off" episode. The efficacy of a second dose for a single "off" episode has not been systematically studied and the safety of redosing has not been characterized. Patients who have a significant interruption in therapy (more than a week) should be restarted on a 0.2 mL (2 mg) dose and gradually titrated to effect. When dosing patients with mild and moderate hepatic impairment, caution should be exercised due to the increased C max and AUC in these patients (see CLINICAL PHARMACOLOGY and PRECAUTIONS ). For patients with mild and moderate renal impairment, the testing dose and subsequently the starting dose should be reduced to 0.1 mL (1 mg) (see CLINICAL PHARMACOLOGY and PRECAUTIONS ). Patients should be instructed to administer apomorphine as described in the Patient Instruction Leaflets. APOKYN (10 mg/mL) containing apomorphine hydrochloride (as apomorphine hydrochloride hemihydrate), USP is supplied as a clear, colorless, sterile, solution in 2 mL glass ampules and 3 mL cartridges. The 3 mL glass cartridges are used with a manual reusable, multiple dose injector pen. The pen can deliver doses up to 1.0 mL in 0.02 mL increments. The pen is provided in a package with six needles and a carrying case. Read the Patient Information that comes with APOKYN before you start taking it and each time you get a refill. There may be new information. Share this information with your caregiver. This leaflet does not take the place of talking with your doctor about your medical condition or treatment. If you or your caregiver do not understand the information, or have any questions about APOKYN, talk with your doctor or pharmacist. APOKYN is used by injection, as needed, only to treat loss of control of body movements in people with advanced Parkinson's disease (PD). This condition is also called hypomobility or "off" episodes. An "off" episode may include symptoms such as muscle stiffness, slow movements, and difficulty starting movements. APOKYN may improve your ability to control your movements when it is used during an "off" episode. This may help you walk, talk, or move around easier. APOKYN is not used to prevent "off" episodes. APOKYN does not take the place of your other medicines for PD. allergic to APOKYN or to any of its ingredients. The active ingredient is apomorphine hydrochloride. APOKYN also contains a sulfite called metabisulfite. Sulfites can cause severe, life-threatening allergic reactions in some people, especially in people with asthma. Tell your doctor if you have had an allergic reaction to any "sulfa" containing medicines. See the end of this leaflet for a complete list of ingredients in APOKYN. being treated with certain drugs to treat nausea and vomiting or irritable bowel syndrome. These medications (including, for example, ondansetron, granisetron, dolasetron, palonosetron, and alosetron) are called 5HT 3 antagonists or blockers. People taking this type of drug together with apomorphine have had severely low blood pressure and lost consciousness or "blacked out." APOKYN has not been studied in children. are pregnant or planning to become pregnant. It is not known if APOKYN can harm your unborn baby. are breastfeeding. It is not known if APOKYN passes into your milk and if it can harm your baby. You should choose to either use APOKYN or breastfeed, but not both. about all the medicines you take, including prescription and nonprescription medicines, vitamins, and herbal supplements. APOKYN and certain other medicines interact with each other, causing serious side effects. This happens especially when you take APOKYN with certain medicines called "vasodilators" and some other medications that lower blood pressure, or take medicines that make you sleepy. Keep a list of all the medicines you take. Your doctor or pharmacist will tell you if you can take APOKYN with your other medicines. How should I take APOKYN? Read the APOKYN "Instructions for Use" for complete instructions on preparing and giving an injection of APOKYN. Do not inject APOKYN unless you and your caregiver have been taught the right way and both of you understand all the directions. Ask your doctor if you do not understand something. Talk to your doctor about which of these is best for your use. Your doctor will tell you what dose of APOKYN to use and how often you should take it. Your doctor will also tell you how to change your dose of APOKYN, if needed. Do not change your dose of APOKYN or use it more often unless your doctor has told you to. Choose an injection site on your stomach area, upper arm, or upper leg. Change your injection site each time APOKYN is used. This will lower your chances of having a skin reaction at the site where you inject APOKYN. Do not inject APOKYN into an area of skin that is sore, red, infected or damaged. Never reuse needles with your APOKYN Injections. Use a new needle with each injection. Only use APOKYN that is clear and colorless. Do not use APOKYN that is cloudy, green, or contains particles. Call your pharmacy for a replacement. Your doctor will usually prescribe another medicine called an "antiemetic", to take when you are using APOKYN. Antiemetic medicines help to lessen the symptoms of nausea and vomiting that can happen with APOKYN. If you take too much APOKYN, you may experience more side effects than usual and they may be stronger than usual. If you are experiencing more side effects or stronger side effects than you commonly have, you should contact your physician immediately. If you are unable to contact your physician, you should have someone take you to the Emergency Room. It is a good idea to discuss this potential problem with your physician at the time that you start APOKYN. What should I avoid while taking APOKYN? Do not take APOKYN with any of these drugs: ondansetron, dolasetron, granisetron, palonosetron, and alosetron or any drug of the 5HT 3 antagonist class or group. Do not drink alcohol while you are taking APOKYN. Alcohol used with APOKYN can cause worse side effects. Do not take medicines that make you sleepy while you are taking APOKYN. Do not drive a car, operate machinery, or do anything that might put you at risk of getting hurt until you know how APOKYN affects you. APOKYN may cause dizziness or fainting. Tell your doctor if you get dizzy or faint with APOKYN. What are the possible side effects of APOKYN? heart problems. If you develop shortness of breath, fast heartbeat, or chest pain while taking APOKYN, call your doctor right away or get emergency help. severe nausea and vomiting. Severe nausea and vomiting can happen with APOKYN. Talk to your doctor about medicines you can take to help prevent nausea and vomiting. Some patients may stop having nausea and vomiting with APOKYN after using it for some time. Some patients will keep having nausea and vomiting with APOKYN. Tell your doctor if this is a problem for you. sleepiness or falling asleep during the day. Some patients treated with APOKYN may get sleepy during the day or fall asleep without warning while doing everyday activities such as talking, eating, or driving a car. Tell your doctor if you (or your caregiver) see either of these effects. falls. The changes that occur with PD, and the effects of some PD medicines, can increase the risk of falling. APOKYN can also increase this risk. sudden uncontrolled movements (dyskinesias). Some people with PD may get sudden, uncontrolled movements after treatment with some PD medicines used to treat PD. APOKYN can cause or worsen this effect. dizziness. APOKYN can lower your blood pressure and cause dizziness. This effect usually happens when APOKYN treatment is started or when the APOKYN dose is increased. With dizziness, there may also be other symptoms such as nausea, fainting, and sometimes sweating. Do not get up too fast from sitting or after lying down, especially if you have been sitting or lying down for a long period of time. Tell your doctor if dizziness is a problem for you. hallucinations. APOKYN may cause hallucinations (seeing or hearing things that are not real) in some people. Call your doctor right away if you get hallucinations with APOKYN. depression. Some people get depression while taking APOKYN. Call your doctor right away if you get depression with APOKYN. headache. APOKYN can cause headaches. If these become severe or do not go away, call your doctor. injection site reactions. Soreness, redness, pain, bruising or swelling, or itching may happen at the injection site. Changing the injection site with each injection, and putting ice on the injection site before and after injections, may help lower these effects. APOKYN can also cause yawning, a runny nose, and swelling of your hands, arms, legs, and feet. Talk to your doctor about any side effects that bother you or that don't go away. These are not all the side effects with APOKYN. For more information, ask your doctor or pharmacist. How should I store APOKYN? Store APOKYN ampules and cartridges at room temperature, 77°F (25°C). Syringes can be filled from the APOKYN ampules the night before use and stored in the refrigerator until the next day. When traveling, keep the ampules, cartridges, and pre-filled syringes at 59 to 86°F (15 to 30°C). Keep APOKYN and all medicines out of the reach of children. Medicines are sometimes prescribed for conditions that are not mentioned in patient information leaflets. Do not use APOKYN for a condition for which it was not prescribed. Do not give APOKYN to other people, even if they have the same symptoms you have. It may harm them. This leaflet summarizes the most important information about APOKYN. If you would like more information, talk with your doctor. You can ask your pharmacist or doctor for information about APOKYN that is written for health professionals. You can also call 1-877-727-6596 or visit www.apokyn.com for more information. What are the ingredients in APOKYN? Inactive ingredients: sodium metabisulfate, NF, water for injection, USP. It may also contain sodium hydroxide, NF and/or hydrochloric acid, NF. The cartridges also contain benzyl alcohol.